Today I’m going to write about something I never thought I’d devote an entire blog entry to: The best grocery cart I’ve ever used. I went to Schnuck’s (a St. Louis chain of grocery stores) to find that they’d replaced all of the old metal grocery cards with these new plastic ones. Anything new is fun, of course, but I was surprised to discover just how big of an upgrade these carts are. Some serious product design went into these carts. It has three shelves. Three shelves = room for more stuff, especially on the smaller carts that I prefer. The key is that they made the top shelf much shallower. I think someone realized that a really deep shelf isn’t necessary–people would rather have more shelves than stack stuff on top of other stuff. 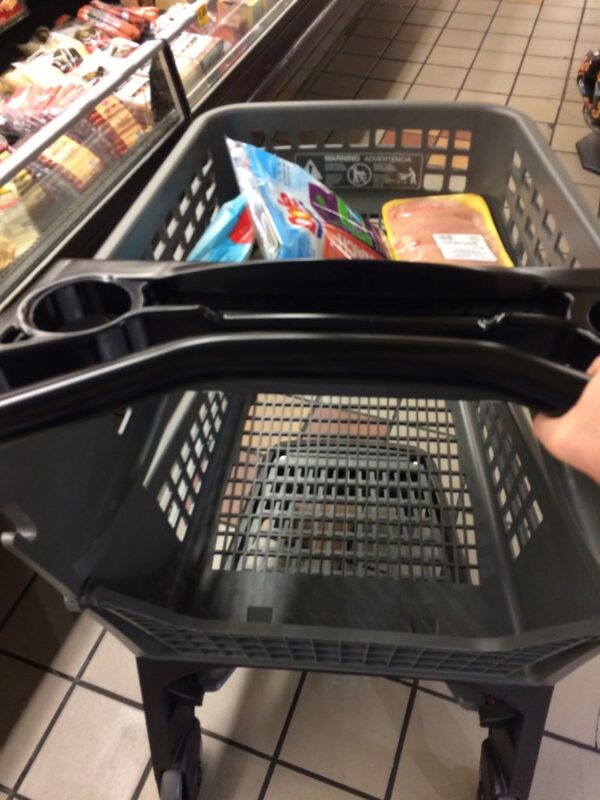 The middle shelf is accessible from the back of the cart. How brilliant is this?! The standard metal carts required you to squeeze stuff into the bottom shelf from the front, but I can now pick up a new bottle of juice and place it into the back of the cart in a single motion. It’s amazing. They’re silent. I never really noticed just how much noise metal grocery carts make until now. The difference was huge–instead of the constant rattle, the grocery store was peaceful and serene. It holds your cell phone. If you look at the photo below, you can see a small, shallow shelf where my phone would have been if I weren’t taking a photo of the cart. I keep my grocery list on my phone, so I can now read the list as I’m walking around without having to stop. It has built-in drink holders and bag hooks. I honestly think they should start selling drinks right at the entrance to the store. Now that the carts have drink holders, I’d love the occasionally luxury of sipping on something delicious while I shop. They can turn on a dime. It’s probably just because they’re new, but the lightness of the carts doesn’t hurt their ability to swivel with precision. Did Schnuck’s need to replace their grocery carts? Not at all. But I was kind of amazed at how delighted I was to be shopping with the new cart, and my happiness probably had an impact on how much I spent. I’m literally excited to go grocery shopping just so I can use the cart again. Good move, Schnuck’s. This entry was posted on Wednesday, October 12th, 2016 at 11:19 pm	and is filed under technology, their brilliant ideas and tagged with technology. You can follow any responses to this entry through the RSS 2.0 feed. I’m curious to find out if the other locations around the St. Louis area have upgraded to the new zero-turn carts (I imagine that is the correct name for it, since that’s what the fancy turn on a dime tractor is called). Also, what happens to old shopping carts when a store replaces them all?! Is there a shopping cart retirement home or do they all just go to live in the big trash heap in the sky? I’m curious about that too. I’m guessing they were sold or given to another store, but I don’t know. I’ve started to use Kroger/Payless’s Clicklist for shopping. While when shopping for things like steak and fresh vegetables leaves a little to be desired for everything else its great. Add things to your grocery list, set a pickup time and drive to the store and they put it in your car. No extra charge. They don’t accept tips even. For those weeks where I’ve been extra busy and just can’t find the time to go to the grocery store to pick up what I need it really works, and cuts down on the extra stuff that you pick up just browsing the store. I’ve used it at least three times in the past two months, and while they sometimes don’t have some of the items on the list, they bring out substitutes that you can either decline or accept. That sounds like a really nice service, Sean! From a business perspective, I can see how that might make you choose Kroger over a different store. Though I wonder how much they lose from you not adding unexpected items to your list as you’re browsing the shelves. As a father, I had to laugh, because I saw a similar “upgrade” starting nearly 20years ago with strollers. For years, you had the standard “umbrella” stroller for whisking the child through a crowded airport or the much larger variety which didn’t fold down into something more compact…you basically had to hitch it to the back of the car. Then, along came Grayco…these guys are amazing! From strollers to playpens, and everything in-between. Back to the strollers, you had a place for your cup, phone, additional toys for the baby…simply brilliant. Here in VA, our Giant received a recent facelift with respect to the carts, in which they’re smaller and easier to navigate around turns; possesses the cup an/or flower bouquet holder; and a small shelf for half or full gallons of milk, water, etc. Joe: That’s very interesting to hear about strollers! I haven’t had the pleasure of buying a stroller myself, but from what I’ve seen from my friends’ stroller’s, they’ve become quite advanced! oohhhh, fancy! I would like to ride one down the aisle and go “WWWWEEEEEEEE! !” sharp turn to test that turning precision. Jasmin: That’s the one downside: The new carts don’t have a lip on the back for your foot, so I don’t think you can use them as a skateboard anymore. A chain here in the UK swapped the metal hand baskets for plastic ones a while back. The thing I don’t like about the plastic ones is they get very dirty. Whilst the metal ones can also get dirty, there a lot less material and the wire is rounded leaving a tiny contact area. The plastic ones have much larger, flat surfaces which collect all manner of stickers and muck. I guess they should clean them more regularly. I see the layout and it’s definitely a single person’s shopping cart. There is no seat for kids. What I would love as a parent is if I could drop off my kids with a attentive grandmotherly type person in the front of the store before grabbing a newfangled cart and zipping around the store with ease. I could say goodbye to the annoyance of having my son in the larger section of the cart and my daughter in the little fold out seat that you have in the traditional carts. After putting both my kids in the cart there is hardly any room for actual food. Then there is the boredom factor of being a kid in the older carts. That boredom either leads to whining or in some cases outright crying until we get to the cereal isle or stop for a moment in front of the ice cream fridge. So a complimentary daycare service would be a great improvement which would allow me the chance to use a cart like the one you teased me with in your post. Another thing is that there are hardly any of our local stores that use plastic carts and I doubt that any of them will change for anything more modern anytime soon. You see, Target closed up shop in Canada a while ago and aside from them we are stuck with chains like Loblaws/Provigo, IGA, Metro, and over the last few years local Walmarts have started to sell groceries. None of them have done much to improve the chore of grocery shopping over the years. Brent: I think Schnucks has 3 different types of carts now: 1 for parents with kids, 1 big cart, and 1 mini cart (like the one in the photo). But they don’t offer the service you mentioned–that’s a great idea! IKEA does that. Yes… Ikea seem to understand that shopping is usually easier without passengers in your cart. I find the whole point of getting yourself to a grocery store is to have a harmonious experience where you can have everything you need within 30 minutes or less. With kids along for the ride in the cart I’d say I’m lucky if I’m done within 45 mins – 1 hr.